Mohammad Ajman Miah, mostly known as Tommy Miah, is a famous Bangladeshi-born British celebrity chef and entrepreneur born in 1959 at Maulvibazar in Sylhet, Bangladesh, and at the age of ten he arrived in Birmingham, United Kingdom. Tommy is the owner of the award-winning “Raj Restaurant” in Edinburgh, and the founder of the “International Indian Chef of the Year Competition”, the most prestigious event in Indian culinary calendar. Tommy Miah is also a famous media celebrity and TV chef, and has a wide experience of international dining and catering. Miah was elected as a “Fellow of Britain’s Royal Society of Arts” in 2004. Though he lives in UK, he often comes back in Bangladesh. 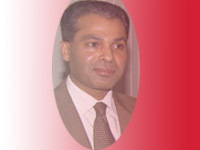 Tommy established a hospitality management institute in Bangladesh named “Tommy Miah Institute of Hospitality Management” to educate and train young Bangladeshis for the field of international hospitality industry. He also involved in various businesses in Bangladesh. Tommy Miah has participation in various prestigious events to represent Bangladeshi and other dishes. He also involved in various humanitarian activities in UK and Bangladesh.